The dreadlocked singer, who was one of the best loved and most influential exponents of the genre, died on 1 July from pneumonia after years of illness. He was 42. Born in Kingston in 1957, he was seen as a child prodigy in the 1960s and went on to record many hits, including How Could I Leave and Here I Come. Despite a national outpouring of grief, Brown's funeral was an event marked by music and dance. Crowds packed into the National Arena to watch a live tribute concert. Brown's five sons were among the performers, as well as reggae artists Maxi Priest and Shaggy. Prime Minister PJ Patterson described Brown's music as "a sweet song and soothing balm for our nation." 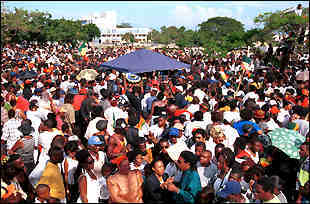 Brown became the first entertainer to be buried at Kingston's National Heroes Park. In the two days before the funeral, more than 10,000 mourners spent hours filing past the casket where Brown lay. Brown rose to prominence in the 1970s wave of reggae singers, that included Bob Marley. He released more than 50 albums. His first hit song was No Man is an Island - which he recorded in 1969 at the age of 12. DENNIS Brown was only 42 when he died on Thursday morning at the University Hospital of the West Indies. Few younger Jamaicans may have realised Dennis Brown's relative youth; older ones would have reminded themselves of the fact. They would have to recall that Dennis Brown was once called the Boy Wonder; that he was a pre-teen when he began thrilling Jamaican popular music audiences three decades ago. Over the next several weeks, and in the months to come, many will eulogize Dennis Brown for his singing; reflecting on his smooth mellow style and his vocal range. Many will agree with producer Mikey Bennett's assessment that Dennis Brown was "the best thing that ever happened to a reggae song". Even if he wasn't, he came pretty close to it. He may not have had the crisp clear voice of John Holt, the infectiousness of that other rock steady great, Alton Ellis or the unrestrained charisma of Bob Marley. But there is an inviting silkiness about a Dennis Brown song that incites romance, yet at times there is melancholy. The same Dennis Brown may swing from the deceptive ease of Silhouettes to the unrestrained urgency of a song like Revolution,becoming the social firebrand ready to take up arms on behalf of the people. Life is often full of what-ifs and what-may-have-beens. So there will be the questions of why Dennis Brown, for all his talent and prolific output, did not achieve the international recognition of a Marley or even a Jimmy Cliff. There are things that he might have done differently to ensure the breakthrough that would have moved him, in public perception, beyond that status of king in waiting. But Dennis Brown's legacy will be more than today's fame. For his greatness includes something very few entertainers, and more so purveyors of popular culture, are ever able to achieve. He remained popular and current for 30 years, from the rocksteady days of Sir Coxone Dodd's Studio One through the revolutionary reggae era of the 1970s and into the 1990s, when he still held audiences with his special blend of lovers' rock. He transited it all without ever compromising his role as a serious musician. Dennis Brown will no longer weave his spell of vocal magic on the stages of Jamaica and elsewhere in the world; but happily he has been captured for eternity on compact discs and vinyl recordings. Thanks for the joy you provided, Dennis Brown. popularly called the Crown Prince of Reggae has rocked the local entertainment industry. who started his career at age 12, and developed his craft, to be dubbed unofficial "Crown Prince ." "Next to Bob Marley this is the greatest loss for the Jamaican music industry. I don't think we will see a second to him in our lifetime." The promoter said he had been working with Brown on a project and later this evening they were to have done an interview and photo shoot. "He is a man that always delivers. It is unfortunate that this time he couldn't deliver physically, but I am sure he will be there in spirit," he said. 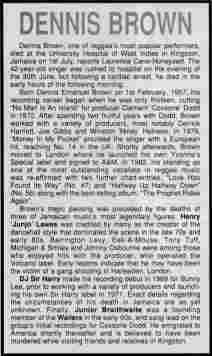 Brown's album 'Inseparable' which was being played by his neighbour. Local singer Richie Stephens said he had always seen Dennis as one of the greatest reggae artistes. "He has always been my idol, the person I wanted to sound like, to be like and wish to meet," Stephens said. He said when he met Brown he came to know that he was a great person- humble, respectable and kind. "Reggae has lost a great asset, may his soul rest in peace," Stephens said. Minister of Industry and Tourism P.J. Patterson, currently Jamaica's Prime Minister. PRIME MINISTER P. J. Patterson, on behalf of the Government, Opposition Leader Edward Seaga, Bruce Golding for the National Democratic Movement (NDM) and individual politicians, yesterday paused to pay tribute to the memory of Dennis Brown. "Over the years, Dennis Brown has distinguished himself as one of the finest and most talented musicians of our time," said a news release from the Prime Minister. "The Crown Prince of Reggae as he was commonly called has left us with a vast repertoire of songs which will continue to satisfy the hearts and minds of Jamaicans for generations to come." Jamaica Labour Party (JLP) leader Edward Seaga expressed shock at the death of the musician. "I remember 'Little Dennis Brown' as we called him in the '60s being a part of my youth in West Kingston," said Mr. Seaga, recalling Brown's first performance at the National Arena before an audience that included then Prime Minister Hugh Shearer. JLP Member of Parliament Babsy Grange also reminisced about the Dennis Brown of West Kingston. "He was one of our shining stars," she said, "one we loved dearly. We shall miss him and his great musical performances." 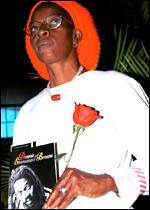 The death of Brown, the fifth international Jamaican artiste to pass away this year, "means that we'll be entering the new millennium poorer artistically," Miss Grange added. Extending sympathies to the Brown family and members of the music fraternity, the NDM's Bruce Golding noted that "Jamaica has lost a gifted and powerful musician. JLP MP for South Clarendon Mike Henry described Brown as one of the pioneers and "im-parters of the soul and spirit of Jamaica's music. Dennis Brown, one of reggae's most popular performers, died at the University Hospital of West Indies in Kingston, Jamaica on 1st July, reports Laurence Cane-Honeysett. The 42-year old singer was rushed to hospital on the evening of the 30th June, but following a cardiac arrest, he died in the early hours of the following morning. 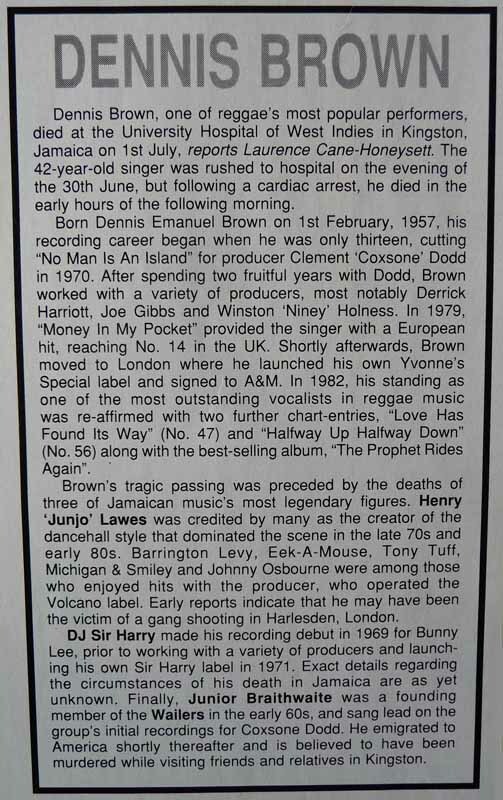 Born Dennis Emanuel Brown on 1st February, 1957, his recording career began when he was only thirteen, cutting "No Man Is An Island" for producer Clement 'Coxsone' Dodd in 1970. 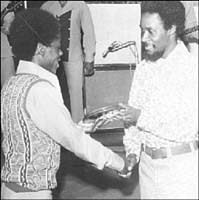 After spending two fruitful years with Dodd, Brown worked with a variety of producers, most notably Derrick Harriott, Joe Gibbs and Winston 'Niney' Holness. In 1979, "Money In My Pocket" provided the singer with a European hit, reaching No. 14 in the UK. Shortly afterwards, Brown moved to London where he launched his own Yvonne's Special label and signed to A&M. 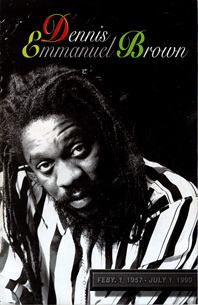 In 1982, his standing as one of the most outstanding vocalists in reggae music was re-affirmed with two further chart-entries, "Love Has Found It's Way" (No. 47) and "Halfway Up Halfway Down" (No.56) along with the best-selling album, "The Prophet Rides Again". Dennis Brown, a popular and prolific Jamaican reggae singer, died on Thursday at University Hospital in Kingston, Jamaica. He was 42. The cause was respiratory failure, said a spokesman for Heartbeat Records, which has released several of Brown's albums. Born in Kingston, Mr. Brown had already perfected his sweet singing style and had his first reggae hit by the time he was 12, with the single "No Man Is an Island," recorded at Studio One. He soon began branching out, working with producers like Winston (Niney) Holness and Joe Gibbs, with whom he recorded many of his most popular songs. Known for his gentle, beseeching voice -- one of the best of his generation -- he mixed soulful love songs with universal pleas calling for peace and harmony. As reggae trends changed from lovers' rock to dance-hall to digital music, Mr. Brown floated easily into each new style. His many hits included "Westbound Train," "Baby Don't Do It," "Ghetto Girl" and "The Look of Love." He had several hits in Britain, including "Money in My Pocket," and in the early 1980's signed with A & M Records and lived for several years in London. Nicknamed "Emmanuel, the Crown Prince of Reggae," Mr. Brown recorded more than 50 albums. This year alone he had already released three records, with a fourth on the way, each one for a different independent label. He was nominated for a Grammy Award for his album "Light My Fire," released in 1994. "I was once young and now I'm old," he sings on one of his albums from this year, "Bless Me Jah." "And through all the changes in life, mankind has grown cold/Where is the love and happiness that we ought to share?" He is survived by his wife, Yvonne, and 13 children, according to Radio Jamaica.